New Delhi, March 18: The latest pre-poll survey released by news channel Times Now, in coordination with the research agency VMR, predicts another term for the Narendra Modi-led National Democratic Alliance (NDA) government. The opinion poll, broadcasted on Monday, said the BJP-led coalition would win 283 seats -- nearly 50 short of the number achieved in 2014. The survey signals a major shift in the electoral prospects of the ruling alliance, as the opinion poll conducted by VMR last month had predicted 251 seats for the NDA in the upcoming Lok Sabha elections 2019, nearly 21 short of the full-majority mark. C-Voter Opinion Poll Says NDA Will Marginally Fall Short of Majority. Meanwhile, the Congress-led United Progressive Alliance (UPA) is predicted to win 135 seats, and the others or non-aligned parties/individuals winning the remaining 125 constituencies. 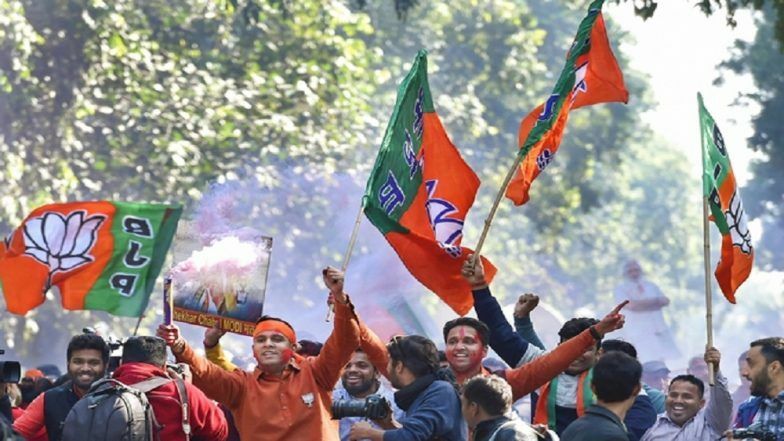 According to psychologists observing the opinion poll outcome, the survey is a short in arm for the prospects of the BJP in Uttar Pradesh, where, the party, along with its ally Apna Dal, is predicted to win 42 out of the 80 seats. The prediction is way higher than what other surveys have predicted for the saffron alliance, expecting it to not to win more than 30 constituencies. According to BJP spokesperson Gaurav Bhatia, the survey - though indicating an electoral mood in favour of Prime Minister Narendra Modi - has failed to gauge the extent of his popularity and goodwill among voters. "We are hopeful of winning more than 350 seats under the leadership of our PM," he said.